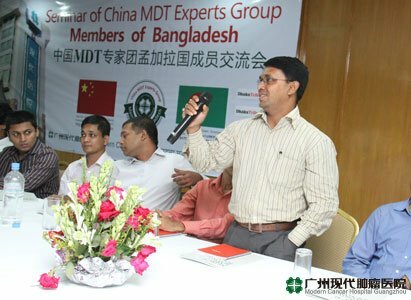 25.5.2013(Saturday) Guangzhou Modern Cancer Hospital Dhaka Office invited Chinese MDT Panel members to carry out a medical oncology seminar. Topic: "New cancer treatment concept - multidisciplinary treatment (A New Concept of Treating Malignant Tumors --- Multidisciplinary Combined Therapy)".Speaker: chief consultant of Modern Cancer Hospital Guangzhou Dhaka office and China MDT Team member Dr. Enamul Haque. 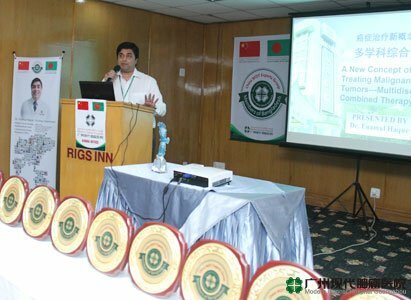 As well as, analyst of Dhaka office Wang Le carried out the lecture of “Prevention and Recovery of Cancer". 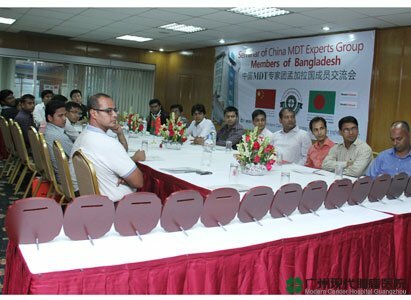 After completing the lecture course by China MDT expert team members then the new members of Bangladesh actively raised their hands to speak and consulting. The discussion was very active. When a new member asked “What is MDT?” Secretary-General Dr. Enamul Haque: MDT is a multidisciplinary clinical team, usually refers to two or more related disciplines working group composed of fixed and to develop a set of specific conditions suitable for patient treatment programs in order to achieve maximum improve treatment. In China, Guangzhou Modern Cancer Hospital team concept is to use MDT to treat patients with advanced cancer. New member asked: Why have a team of experts MDT to treat cancer patients? Secretary-General Dr. Enamul Haque: Cancer is a chronic disease process can be from a few months - for decades. Individualized multidisciplinary treatment to avoid one-sidedness, reducing treatment errors. Only MDT team of experts to determine the total treatment strategies and treatment processes to reduce errors. After ending of the lecture, China Guangzhou Modern Cancer Hospital Dhaka office manager Li Hu presented an eagle trophy to China MDT team member Bangladesh Secretary General Dr. Enamul Haque and appreciated Dr. Enamul Haque promoting the contribution of medical oncology and pictures. Modern Cancer Hospital Guangzhou Dhaka office manager Li Hu attended the lectures of China Medical Oncology MDT expert team members in Bangladesh and honored new members by giving commemorative medals. Finally, Modern Cancer Hospital Guangzhou Dhaka office consulting with the MDT members of Bangladesh tentatively. 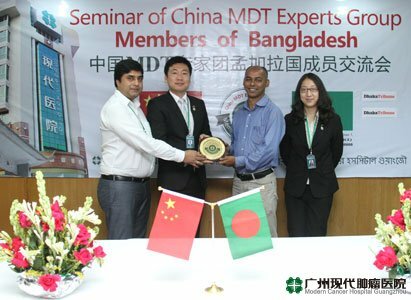 The second session of the China MDT expert team members in Bangladesh will be held in June 28, 2013. Referrals welcome Bangladesh various professional disciplines doctors and medical workers to attend. 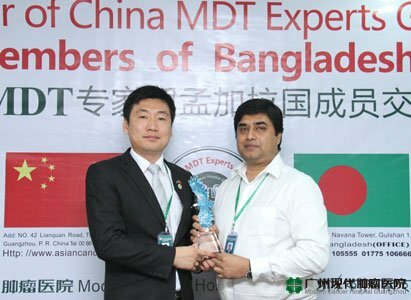 China MDT expert group member Dr. Abdullah Al Masud is presented honorary membership crest.